Removing deep, set-in stains from your carpet can be a hassle, but D&G Carpet Cleaning has you covered. Depending on the type and size of stain, D&G Carpet Cleaning will decide upon the best treatment option for your individual situation. Protein-based stains, like blood or milk, need to be treated with cold water so as not to set the stain further into your carpet. A piece of fruit or ink from a messy marker on the other hand is a dye-based stain, and hot water and possibly detergent may be needed to remove them from the carpet. 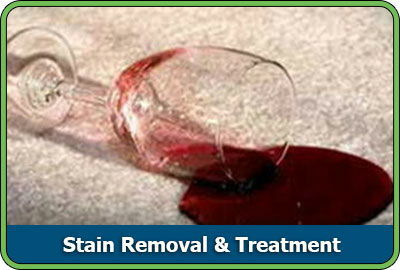 Glasses of wine or mugs of coffee stain carpet with naturally present tannins, but if you use soap, it will actually help set the stain rather than remove it. D&G Carpet Cleaning has years of experience with stains caused by anything and everything you can think of. Call today for an estimate and let us help you decide on a course of treatment for your stubborn carpet stains.